Since 1997, Corporate Realty has shared a monthly mailer that not only highlights our recent transactions, but a recipe or story from a great local restaurant. In the past, we’ve featured recipes from Commander’s Palace, Leah Chase, Lucky Dog and many others – and we’re proud to be associated with some of the best Louisiana has to offer. 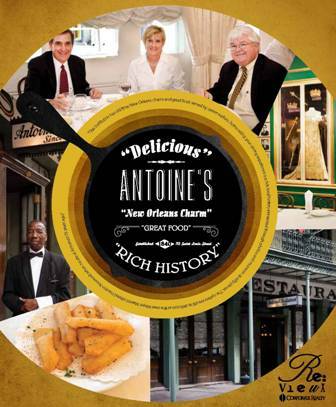 For 2013, the entire Corporate Realty team is pleased to present delicious recipes (that we happily tested for you) that highlight the creativity and traditions coming from French Quarter kitchens. While these restaurants range in style, they are united by their historic French Quarter roots and their commitment to both excellence and innovation. We at Corporate Realty also know what it means to embrace traditions while continuing to improve. Corporate Realty has a long track record of consistently being involved in the largest, most complex and most demanding real estate brokerage transactions in this region. We are proud of our history of success and look ahead to our bright future as we continue to adapt to best serve our clients and customers. Our current featured recipe is for Antoine’s Shrimp & Crawfish St. Pierre. We call Antonie’s “delicious,” what do you think?